When you are in need of a professional to work with for your window treatment needs, you want a name that you can trust in, like Sweet Shutters and Shades. With over two decades of hands-on expertise backing up our Troutman window blinds and shutter company, you can rest assured that we can provide you with quality results. We take great pride in being able to deliver 100% customer satisfaction for every job, every time. The window coverings that you select are like choosing the perfect, customized finishing touches. You cannot have the home of your dreams without taking care of details like this. Even if the look that you want for your window treatments is something clean and simple, that adds to the overall look and feel of your home. It all starts when we provide you with your complimentary in-home consultation, so you can gain the insight you need to make wise choices. This enables us to bring the showroom to you and let you see our samples, inside of your own home, right where they will eventually end up. It is taking this approach, to helping our customers, that has earned us the impeccable reputation that we have. When we meet with you, this will give us the opportunity to review with you all of the options that you have. For some people, shutters are the way to go. At Sweet Shutters and Shades we offer polycore and plantation shutters in Troutman, NC, the two most popular options on the market. There are plenty of advantages to choosing this style of window covering for your home. For one thing, this is an ideal choice to make when you want the maximum light and privacy control. 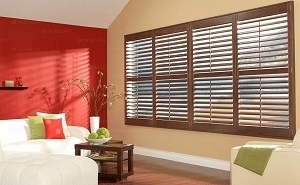 The unique system of slats and louvers helps ensure that you get the optimal ability to adjust and control your shutters. This style of window covering is also perfect for enhancing the energy efficiency of your home. They offer thermal insulating capabilities, which helps with internal temperature, saving you money on your monthly bills. Plus, it certainly doesn't hurt that it helps make your home look fantastic too. The combination of styles, colors and patterns is seemingly endless. You can easily create the perfect look for any room in your home, by opting for window blinds. While the privacy and light control is not as versatile as you get with shutters, it is a close second. You have much more flexibility in your ability to control the slats and change the view, lighting and more. Contact Sweet Shutters and Shades today to find out more about our great selection of window blinds in Troutman, NC! If you are looking for an experienced Troutman shutters or window blinds professional then please call 704-980-4303 or complete our online request form.